I’m sure it’s happened to us all! You’ve been searching on the internet for ages to find the right solution to your coding problem, comparing plugins until you find the one that’s perfectly suited to your needs. But alas, there is no WordPress plugin to let you easily implement it on your site. I mean, sure…you could hard-code it into your template, but the beauty of a WordPress plugin is that the code is isolated. Build it once, and you can plug it into any theme you like with relative ease. If this sounds like you, then you’ve come to the right place. Alternatively, if you’re interested in just learning the basics of coding a WordPress plugin, then this tutorial should be a nice little primer to get you started. Follow along, and if you have any questions, please don’t hesitate to put them in the comments section, or tweet me! For this tutorial, I’ll be using FancyBox v2 – a fantastic lightbox script by Jānis Skarnelis. 1. Choose your desired jQuery plugin and download it. 4. To make your WordPress plugin easy to maintain, it’s a good idea to remove the unnecessary files from your jQuery plugin folder. In the case of FancyBox, we really just need the source folder which contains the FancyBox scripts, css and referenced images. So firstly take your time to locate the core files you’ll need. 5. Move them to the root of your WordPress plugin folder and delete the other unnecessary files. In my example you can see I’ve kept the source folder, and deleted everything else. Okay good stuff, now our work can begin! If your jQuery plugin contains customisation options, you may wish to complete this step. Before we convert the plugin we’ll setup our script, and alter some of the options to make sure it perfectly suits our needs. Please note that the customisation options will be different for every jQuery plugin. As such, you’ll need to read your plugin documentation to understand how to correctly set your custom parameters. For FancyBox, we have a number of customisation options. But for the purposes of this tutorial, I’ll just set a few as an example. The code above is our setup script. It creates a function to scan our page for hyperlinks with the class .fancybox, to which it will then append the FancyBox lightbox script (making everything work). Nice work! You can now move onto the next important step. Building a WordPress Plugin isn’t too hard, so don’t stress if you don’t have any php experience. Just make sure you spell everything correctly, and don’t miss any steps. 4. Awesome! We now have the basic setup completed for our WordPress Plugin. Next comes the fun part – we’ll add some code to locate our jQuery CSS file, and reference it in our current WordPress theme. The official name for this method is wp_enqueue_style. 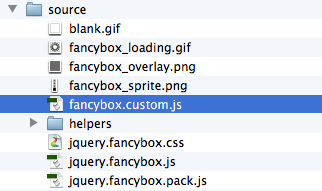 For Fancybox, there is only one CSS file I need to reference. If you’re attempting to convert a different jQuery plugin, then you will need to locate the path to your CSS file/s and adjust this code as necessary. Before we keep going, it’s good to understand what we’ve just written. In the brackets following our method call wp_enqueue_style, we firstly gave our css style sheet a handle (name) fancyboxstyles, then we provided the location url of the file WP_PLUGIN_URL.”/fancybox2/source/jquery.fancybox.css”. You’ll notice that the first half of our url contains the term WP_PLUGIN_URL – this little method makes your life easy by filling in the url of your WordPress plugin directory automatically. The last two false & all declarations refer to the css version number, and the media type (both of which we can leave as the defaults). 5. Good work! Next we need to use a similar method to link up our script files, and get this baby working. To do this, we’re going to use a function containing two different methods: wp_register_script which registers our scripts with WordPress for use, and wp_enqueue_script to link our scripts to the current WordPress theme. Then we’ll use the add_action method to trigger the function and make the magic happen! Once again, it’s good to understand the options within our brackets. Within the wp_register_script method, we gave our scripts a handle (name) – in my example I used jquery.fancybox for my FancyBox script and jquery.fancyboxcustom for my FancyBox custom settings script. Next up we have an array – this allows me to link to any other dependant scripts I might need – in my example, FancyBox needs jQuery, and my FancyBox Custom settings requires both jQuery and Fancybox to work. Lastly, we declare the location url of our scripts, the version number we want to assign to our scripts, and finally the number 1 – which is a boolean that signifies we wish to reference these scripts at the foot (bottom) of our WordPress theme template. And that’s it! You’ve now successfully completed coding your very own WordPress plugin. Now you have your completed code, it’s all smooth sailing from here. 2. Now open up your WordPress admin page, and click the Plugins / Add New option in your sidebar. 3. On the next page, simply click the Upload button at the top of your page. 4. Now select the zip file you just created, and click Install Now. 5. When prompted, make sure you click Activate to turn your plugin on. You can then switch it on and off in your plugins panel. Now that our new plugin is active, we just need to tell it which images we’d like to appear in a lightbox. If you’re using a different jQuery plugin then just check your documentation to find out what else needs to be done from the front-end to make it work. 1. When editing your WordPress post, click on any image you’ve inserted and you’ll notice two buttons appear. Click the one on the left to show our image options. 2. 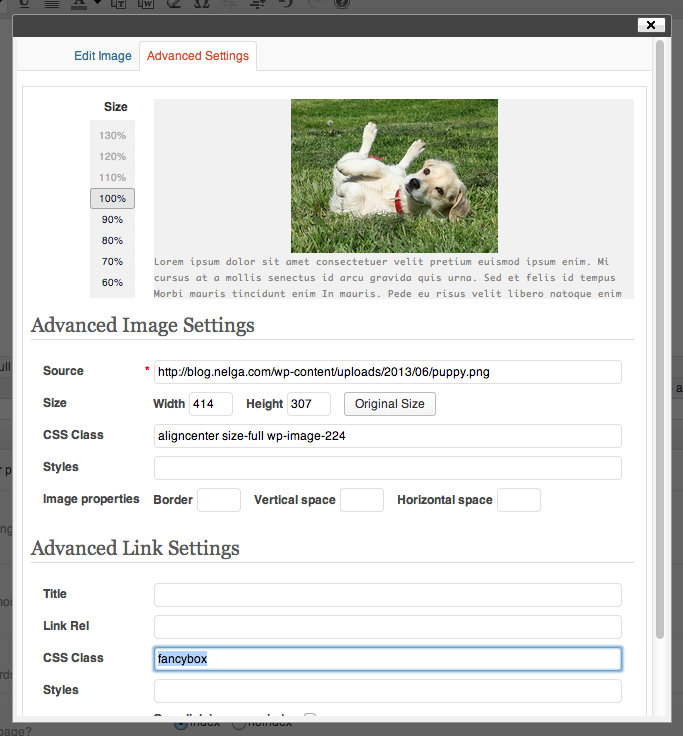 On the Edit Image popup, click the Advanced Settings tab, and simply add the text fancybox to the CSS Class field under Advanced Link Settings and click Update. 3. Publish your post to see the results! Congratulations on finishing the tutorial. If you had any issues, or find that your plugin isn’t working as expected, you can Deactivate the plugin and Delete it from the plugins panel before re-editing your code and uploading again. Stay tuned, and I’ll follow up this article with a tutorial on how to add an options panel to your WordPress plugin too. As always, if you have any questions, please feel free to add them to the comments below and I’ll do my best to help out. Thank you so much for this tutorial, although I have not yet attempted it. I am particularly keen to use it for FancyBox v2 but first need to negotiate the licensing with my client. Also, I will look forward to your follow-up tutorial on adding an options panel. I’ll make sure I get that tutorial up as soon as I can! Great tutorial. I’d definitely be interested in seeing like this! Hi, thanks for the tutorial. I follow it. Full success! I look forward for the tutorial about options panel. Glad you liked the tut Marco! I’ll try and get the options tutorial up soon. I’ve added a subscribe feature in the sidebar too so you can receive an email when new tuts are posted that might be useful for you! How can i enable arrows, I am unable to show arrows. Hi. Good news about the options panel? Can you help me with a similar sort of plugin. It is a existing plugin and I am looking forward to add a feature with JQuery? I want to do it myself, just don’t know where I am going wrong. Hi Swapnil, what features were you hoping to add? Great tutorial . Thanks you ! Hi. Great and simple tutorial. I have jQuery marquee plugin http://aamirafridi.com/jquery/jquery-marquee-plugin which I want to convert to WP plugin. I want user to Enter marquee text, and all JQ plugin options as options where user can input/checkbox and it will create a short code where user can paste anywhere on page/post to see that marquee.